, : Put a charge counter on Brain in a Bottle. You may cast an instant or sorcery spell with converted mana cost equal to the number of charge counters on Brain in a Bottle from your hand without paying its mana cost. , : Remove X charge counters from Brain in a Bottle: Scry X. It seems playable, but I don't know how much. It looks like an aether vial or birthing pod for instants and sorceries. Best utility seems to be playing sorceries at instant speed (playing tinker in your EOT seems massive). Also after a couple of turns you can play thirst/deluge for 1, then gush/fof/trap, and speaking of 5 fow and misdi cost 1 but save a card. It looks nice with voltaic key, so playing it in a tezz shell seems the best idea in existant decks. However it's another card that suffers rods and stony silence. Btw, I'm not forgetting that this card is card disadvantage, which is really a slop, and can make this unplayable. This is definitely interesting and its a card I think will get tinkered with (no pun intended...I think) a lot. I like this card in Modern and Legacy. I don't know that it's fast enough for Vintage, but it MIGHT be, since it's the cheapest way to cast Tinker on your opponent's end step we have at the moment. This is significant. If you drop this, you're not dropping Jace, Goyf, Stoneforge, or some other clearly amazing two-drop. It's also likely not coming down on turn 1. In my mind, this is a huge liability. If any single problem will keep this from seeing play, it is the fact that it costs 2 instead of 1. This is reasonable. Assuming you had 2 mana to cast it, it should be relatively easy to keep piloting your Modern or Legacy deck with 1 open mana at the end of your turn. End step, tap to ramp up Brains, should be pretty common. And, unless Chalice causes a sea change in how Legacy and Modern decks are built, you will ramp this to 1 - 3 and keep it there depending on what kind of spell you want to have on tap. This is really important to make this card work. It allows you to ramp it back down, and without it, you might ramp it to 3 and then situationally want to be able to cast a cheaper spell. The fact that it's scrying reasonably deep makes it another very good end step play if you have no reason to ramp it or only want it set at 1. Very self-synergistic and a great design choice. A - It fixes your mana. You are converting however many <> into colored mana to permit you cast the spell. B - IT RAMPS FOR FREE. Let's say you want to cast Brainstorm. Normally, you spend U and get your 'storm on. With this on the battlefield, you pay <>, storm AND YOU NOW HAVE AN ADDITIONAL MANA OF ANY COLOR TO SPEND NEXT TURN. More precisely, you still got the Brainstorm and you still spent U, but now you can spend <> next turn to get two mana of any color for another spell. You've generated mana, and it hasn't slowed you down AT ALL to do it. C - IT GIVES ALL YOUR SORCERIES FLASH. If you doubt how powerful it is to be able to wait and play spells on your opponent's end step, or in response to countermagic, take a look at Snapcaster Mage and Vendilion Clique. (Hint: it can be REALLY powerful). The templating on this is kind of wonky. So, it's one action to put a charge counter on and play a spell? In other words, the first time you activate it, you can cast a 1 mana spell, then the next time you activate it you can play a 2 mama spell? Can you also play more than 1 1-mana spell after you activate it? It seems like you can't "store a spell" so to speak by activating and playing the spell at a later time. Right? enderfall: It seems only one spell at a time. I forgot to comment the color fixing side of the card, which can be relevant. But I think that the real application of the card is the mana saving in the long run. As long as this card is used 3-4 times once in play, it can be ok, like playing gifts for 1 and saving 3 mana for countermagic. Otherwise will be just cute unplayable crap. I'd be curious to see colored shops make a comeback with this card. Without the need to significantly weaken the land-base, the deck could be much strong than years past. Plus, the ability to scry will help smooth out some of the problems that shops have with not drawing the things they need. There is no advantage to be gained by playing coloured non-artifact spells that is not obsolesced by the advantage gained through using 4 copies of Mishra's Workshop and not playing those spells. You can play a Tinker for 1 mana at instant speed. This could be really good against Workshops. That's the one reason I haven't called it unplayable. Against non-shops decks, it doesn't generate enough value for it's cost. Unlike aether vial, it doesn't make the spell uncounterable and unlike Birthing Pod, it doesn't generate value in the same way (pulling the card from the library). So I'm just wondering if the cost of the card is actually worth the effect here? It's an initial 2 mana and 1 card investment. This is not negligible. It is also takes a number of turns before it actually has any implications on the game at all. It takes 3 activations and playing a spell each time off it to gain parity in mana. It can never gain parity in cards. Are there any sorceries outside of the restricted list that would be really broken as instants? I think that's the only way I see this playable. Don't you still need to pay any taxes on it? Yeah, but paying for (1) + (x) is easier than paying (2)(u) + (x). You can play any instant or sorcery for 1 mana. I think a lot of people are underestimating this as a mana generating effect. It costs 2 and a card, and that's no joke. However, once you make that investment, in a typical Vintage deck you will be casting cards at the 1 - 3 mana range pretty regularly. Once Brain is out there, you can cast cards with it or not with no real difference except Sorceries get flash and Stifle becomes a slightly bigger roadblock. (Stops the ability so you keep the spell, but lose the 1 mana.) Each time you incidentally use Brain to cast a card, you generate an additional mana of any color you can use next turn. Turn 1: Mox, Island, Delver. Turn 2: Fetch, Brain, pass. Turn 2 Opponent's End Step: Tap U, pay for Brain, cast Ponder. Turn 3: Flip delver thanks to Ponder. We now have 3 mana available and another "virtual" mana of any color thanks to Brain. This isn't magical Christmas land, really. This card rewards you for simply playing Magic. After you've cast two spells using Brain, it's already going to pay for itself mana-wise, and more, on the next activation. And, if you're in draw-go mode down the road, you can cash in a few counters to dig. Scry 3 or more is no joke. It doesn't do as much as Baby Jace for 2 mana, granted, but I think it's very powerful. I think I'm in the market for instant-speed Thoughtseize. Take in mind that instant speed tgz only happens first time and after scrying. Unless you are playing some weirdo like hex parasite. Btw, have I ever wrote about my intentions on play remora and use hex parasite to keep it infinitely in play? There's enough to like to seriously test it. I don't think expensive instant and sorceries is the best route, because a 7 mana spell takes 7 turns of putting counters on BiaB. That's not a winning strategy in Vintage. I think its only practical application is getting through Spheres. It will probably end up a fringe unplayable like Izzet Guildmage. Play this with Izzet Guildmage!?!? This is a way more appealing sphere breaking design than all those suggestions to print a channel or delve shatter. I do like how this can power out instant Preordains and Thoughtseizes. I also think that there are a bunch of two-mana spells like NWhisper, BWish, DTutor etc. that I'm even less motivated to play now the Chalice is restricted. Maybe this would warrant looking into them again! How sick would Brain into Tutor/Wish into Brain into Tinker (saccing Brain) look? Probably not as sick as just casting Tutor into Tinker and being two turns faster and up a card. Actually I'm really digging that idea. One thing I've been looking into is how to use the smallball Preordain engine to bootstrap into big blue plans like Tutor-Tinker. I have found some excellent solutions but it's generally a difficult problem - the best way I can put it is that Preordain promotes efficiency but Tutor-Tinker requires volume shooting. 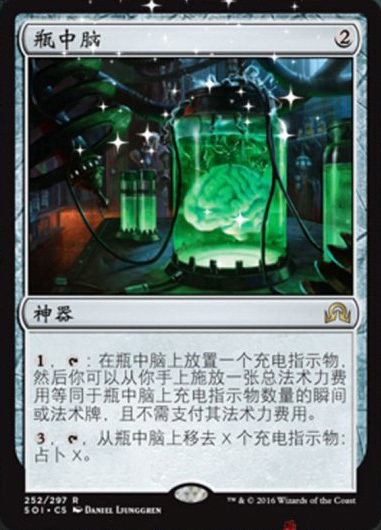 Brain in a Bottle seems like it could be another solution, allowing you to decrease mana density, and it probably has synergy with both Preordains and bigger spells. You're right as always, Chubby! End of discussion! I just like the fact that this allows you to play draw Stevens like wheel and twister at opponents end step. My point still stands that you have traded tempo and card advantage for...Quicken? I'm not sure what the payoff is here. Is there any progress on the "Like" button? Anyway the card is really interesting and stuff. That's always cool. Twiddle into Hidden Strings into Toils of Night and Day into ??? It is an interesting card and I like it as a countermeasure against Spheres and stuff but I just don't see it. You are not winning games by resolving spells that essentially do nothing. You have to spend mana (even though the upkeep is quite low, one mana is a lot, especially in Vintage) and turns until it does what you expect from it and that is only the case if you already have the wanted spell in hand. Also, to use this card to its max efficiency you need to remove counters at some point. Removing these counters costs a lot of mana and all you get out of the deal is Scry x (which will rarely be greater than 3). Scry is fine, but way below Vintage's power level unless it appears on cards like Preordain. Right now I think that people will tinker with it (yay, a pun!) but scrap it soon afterwards. You need specific situations to make this worth a card putting into your deck and these situations will rarely occur. It is neither an early impact card which forces your opponent to handle it, nor does it generate card advantage once games drag on. It just has a lot of baggage attached to it. Hardly any impact, not flexible enough and the scry is just way too expensive - the longer I think about it the more I know this will be the type of bulk card that I will open at the prerelease and never play it anywhere. That said, I'm also not a fan of Aether Vial in Vintage. Cards are strong in a vacuum, so cards need to have a certain impact. Cards that are not flexible enough, which are not actual threats or CA-engines usually lead to situations which feel like "I just paid mana to duress myself". Creating mana is a strong ability though, but is it really worth to do nothing for several turns just to generate 3-4 mana? I doubt it. How does this work with ancestral visions and wheel of fate from future sight? As best I can tell, it doesn't work with them at all, and that's probably intentional. There's never a time when you're doing the casting and there isn't at least one counter on it. Which is really too bad because Workshop with 4 Restore Balance and a regular Balance would be hilarious.